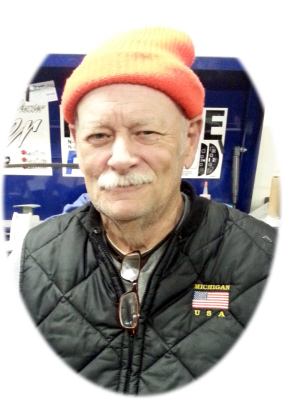 Elden Paul "Homer" Simpson age 74, of Elsie, MI, passed away Sunday, October 21, 2018, at his home. Funeral Services will be held at Smith Family Funeral Homes - Houghton Chapel, Ovid, MI, on Friday, October 26, 2018 at 11:00 A.M., with Carol Kusiner officiating. Burial will follow at Fairfield Township Cemetery, Fairfield Township, MI. Visitation will be held on Thursday, October 25, 2018 from 6-8 P.M. and for one hour prior to the service on Friday. Elden was born in Owosso, MI on January 18, 1944, the son of Ivan and Willetta (Wilcox) Simpson. He graduated from Elsie High School. Elden owned and operated Simpson's Body Shop in Henderson for 35 years. He also worked for Motor Wheel. Elden enjoyed spending time with his grandchildren, his dog Dude, and his granddog Lakota. Elden loved to hunt and fish. He was in the process of preparing his hunting shack for the season opener on Nov.15. While he enjoyed the scenery, we think that he spent more time checking the inside of his eyelids for holes than watching for deer. Elden is survived by 3 children: Debra (Wayne) Smith of Missouri, Scott (Rachel) Simpson of Elsie, and Shelly (Joshua) Cease of Williamston; 8 grandchildren: Jennifer Foster, Joshua Foster, Rachael Foster, Jeanette Gribben, Ella Cease, Abigail Cease, Andrew Wadsworth, and Tayetumn Wadsworth; and 5 great grandchildren. He is also survived by brother Jim (Mary) Simpson. Elden was preceded in death by his parents. Memorials may be made to the family for funeral expenses. Online condolences for the family may be made at www.smithfamilyfuneralhomes.com. The family is being served by Smith Family Funeral Homes - Houghton Chapel, Ovid, MI.